We have been walking around the Budapest Christmas Markets this year to take a look at the amazing gingerbread Christmas tree decorations, some of them with Hungarian folk motifs and a Hungarian twist. 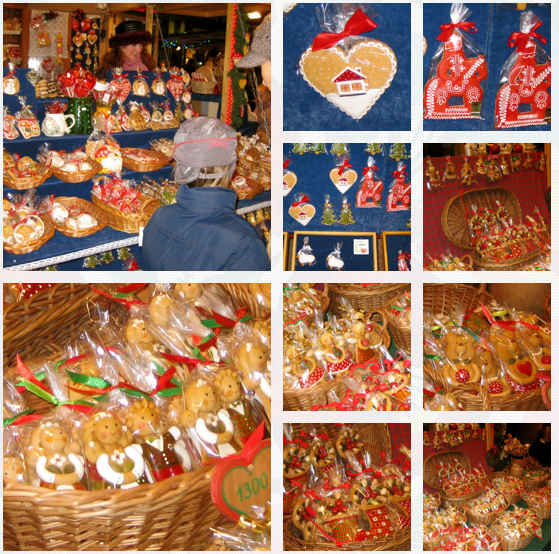 On a traditional Hungarian Christmas tree, you can always find some Christmas Candy, the Szaloncukor, and often see home made gingerbread Christmas tree ornaments, often made together with the kids. Or, bought at the Budapest Christmas Fair. Like these beauties. If you want to do some gingerbread decorations yourselves with the children, there is a playhouse in the middle of Vorosmarty Square at the Budapest Christmas market where you can join the locals to do some Xmas workshops, like decorating gingerbread hearts, bells, etc. The playhouse is open in the afternoons and at the weekends. Free to join. These are some that we liked most. Please send in your photos of the gingerbread Christmas decorations you liked most to BudapestChristmas [at] gmail [dot] com.